We recently had an Italian house warming party and I was in charge of making an almond cake. Let me tell you now that the recipe I chose (well my Mum chose, telling me it was a really easy cake to make….) takes a lot of work and makes a rather small cake. The recipe is taken from The Australian Women’s Weekly Italian Cooking Class Cookbook and the final cake looks pretty spectacular and it also tastes amazing (I would have been very disappointed if it didn’t after all the work I put into it!). Beware when piping the almond mixture on the top of the cake (the zig-zag design and rosettes) that you don’t do what I did and pierce a hole in the pipping bag due to the thickness of the mixture (and possibly the sharpness of my nails and the cheapness of the pipping bag). So here is how to make it (note that the original recipe says to use redcurrant jelly for the filling but I used strawberry jam instead). Combine in a small bowl eggs, sugar and lemon rind. Beat with an electric mixer on high speed until mixture is thick and frothy. Gently fold in sifted flour and cornflour and ground almonds. Lastly, fold in melted butter. Pour mixture into greased 20cm round cake tin. Bake in moderate oven 30 to 35 minutes or until cake is cooked. Turn out on wire rack to cool. Let cake stand overnight (I didn’t do this as hadn’t read the recipe ahead of time and it still worked out well!). Cut cake into three (I only cut it into two as it didn’t rise enough to cut it into three) horizontal layers. Place 1 layer on oven tray, spread layer with jam, top with another layer of cake, spread again with jam, top with final layer. For topping, combine in bowl ground almonds and sugar. Mix together egg yolks and rum, gradually stir into ground almond mixture, reserve. Add 1 tablespoon of unbeaten egg white to remaining mixture, mix well. Spread this mixture around sides and top of cake. Topping should be thicker on top of cake than around the sides. If mixture is hard to spread, mix in a little more egg white. To the remaining almond mixture add 2 tablespoons of unbeaten egg white, place mixture in pipping bag which has been fitted with an open fluted tube. Decorate top with zig-zag pattern. Decorate with small rosettes around edge. Bake cake in very hot oven for 8-10 minutes or until sides of cake turn white and rosettes are lightly browned. Remove from oven immediately. Melt remaining jam in pan, spoon jam between zig-zag design as shown in picture. 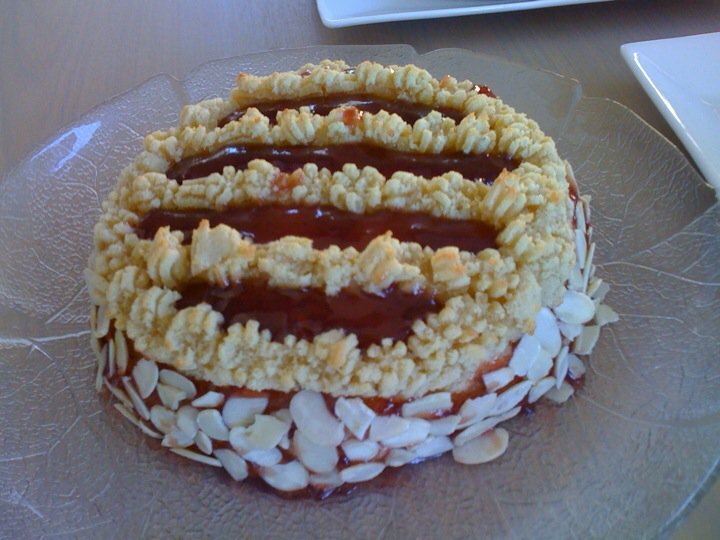 Let cake cool 10 minutes, then spread sides with left over jam and coat with flaked almonds. Allow cake to cool completely before cutting. What is the most spectacular thing you have made?